Apparently it’s mid-November. How did that happen? Today I went to Kohl’s and the place was packed. What gives? Then I tried to go to the mall and couldn’t find a single open parking space in the Macy’s parking lot, so I just said eff it and peaced. The holiday crowds just irk me. And it’s not even Thanksgiving yet. 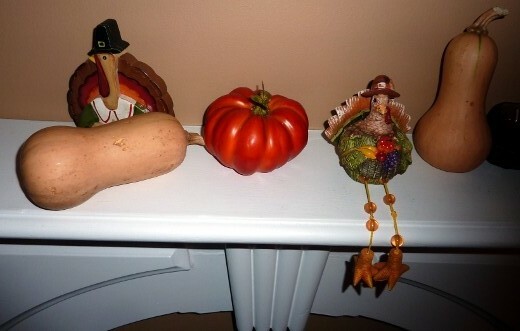 Here is my small, but growing, collection of Thanksgiving decor. I heart my dangly feet turkey. 🙂 The two butternuts are quite small and cute – they are from the Ypsi Fall Farmer’s market for $0.50 each. (And no, I’m not really keeping them on my mantel!). The same evening that I hit up the Ypsi Fall Farmer’s market with JH, I also found it necessary to visit Sidetrack for dinner. Because it’s ridiculous to visit Depot Town without going to Sidetrack. And I don’t like to be ridiculous. 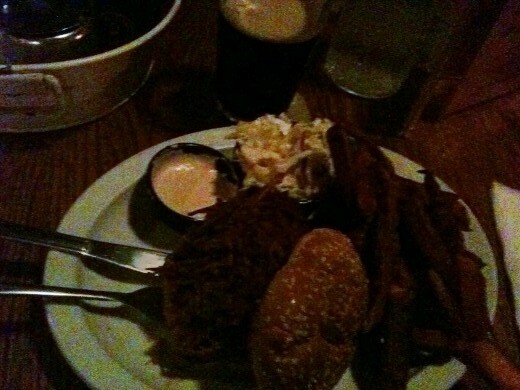 I ordered the BBQ Pulled Pork Sandwich with Sweet Potato Fries. Some Guinness. I’m on a Guinness kick lately, have I mentioned? Awesome. Later this week, it was time to try yet another Ann Arbor eatery recently featured on the Travel Channel’s show, "Man vs. Food," – Tio’s! I definitely used to live one block from where Tio’s is currently located (though it was mediocre Salsarita’s when I lived over there), but I have never tried their food. 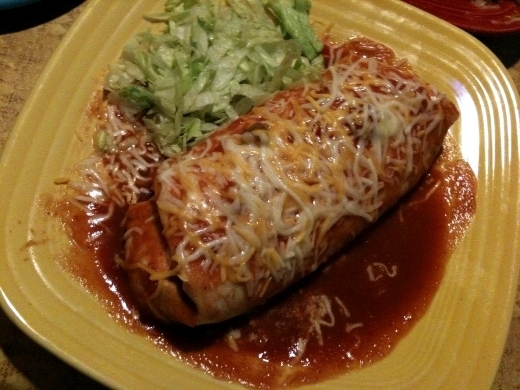 One exception: I went to some food event in Ann Arbor a couple summers ago and tried a bite of their Tio’s wet burrito and it was delish! "Mount Nachismo" was the 5-lb nacho dish featured on Man vs. Food, though this item is no where to be found on Tio’s menu. You must have to ask for it. And the table next to us did. 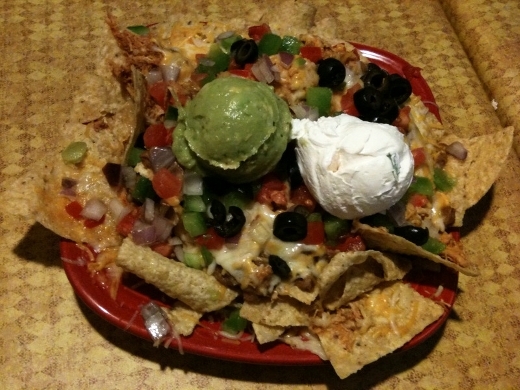 Out came a beyond-giant nacho platter, that drew the attention of many of our fellow diners. We opted for the more modest "small"-size Nachos Grande. Now, you know that I am an aficionada of Nachos. And trust me when I tell you these were legit nachos. I just want to crawl into a bowl of their super-thick sour cream and bathe in it. That good. However, the lack of queso was sad. Melted, shredded cheese just doesn’t do it for me the way melted queso does. T and I split everything that we ordered in half. We each had several bites of a Wet Burrito with Beef (the rest made good leftovers!). This was good. Legitimate. Not amazing, but good. The Authentico – "Ground beef (from Knight’s Market!) topped with onions and cilantro on a warm corn tortilla." Fairly mediocre. Not bad, nothing special. Jerk Chicken Salad Taco – "Jamaican Jerk chicken, spring greens, crispy tortilla strips, onions and tomatoes drizzled with our house dressing all on a warm, pillowy flat bread." Very good. Liked the Jerk spices, would have liked an even spicier flavor though. The flat bread was a-may-zing. 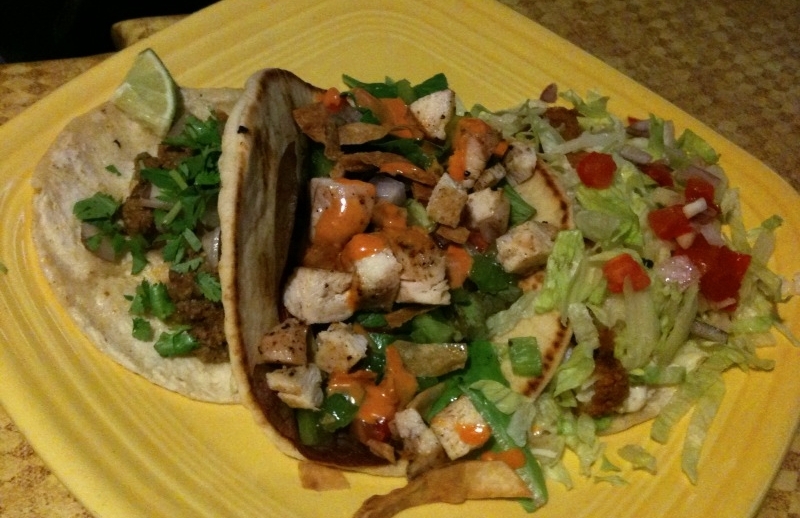 Fish Taco – "A soft, warm worn tortilla wrapped around deep fried cod, jalapeno ranch sauce, lettuce, tomato and onion." Out. Of. This. World. Far and away the best thing we ate at Tio’s. We will be going back simply to order more Fish Tacos! For dessert, I was thrilled that Cupcake Station was still open. I am constantly paranoid that they will be sold out and have closed when we go downtown. 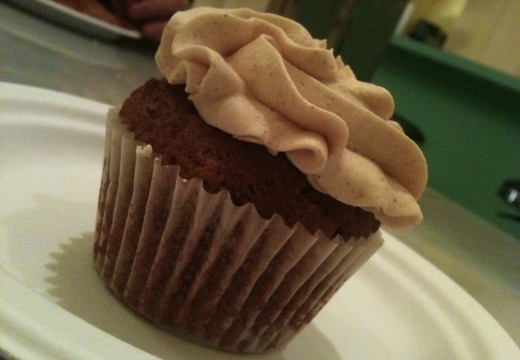 Lucky-me had a Vegan Pumpkin Cupcake. Yum!!! 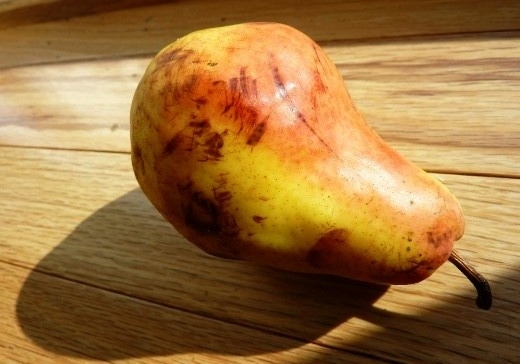 ♪♫ Currently listening to: These Things – She Wants Revenge. Vid #1. Vid #2. Apparently this song has two music videos. I prefer #1. Maybe I’m just a freak. The bass is more intense in Vid #1 to me, so I think that’s part of the reason. What do you think? So obsessed with SWR lately.